Asparagus is not one of the inexpensive vegetables and it’s no wonder. Farmer’s have to devote two years to it’s initial harvest; it doesn't come up the first year. It’s incredibly tasty, though. As such, you want to make sure you get the most flavor out of it. Broiling asparagus is one way to concentrate it’s delicate flavor and add a lovely caramelized touch. It’s also incredibly fast and easy. When choose asparagus, try to find stalks with even thickness. I prefer thinner spears, around one-half inch in diameter. This is young asparagus and has the sweetest flavor. While this recipe calls for extra-virgin olive oil, regular olive oil can be substituted. Served warm or at room temperature, broiled asparagus is a wonderful side to most any meal. Adjust an oven rack to 6 inches under the broiler element and heat the broiler. Remove one asparagus spear from the bunch and bend it at the thicker end until it snaps. Use the broken asparagus as a guide to trim the woody ends from the remaining asparagus. Put the trimmed asparagus onto a rimmed baking sheet. Toss the asparagus with the olive oil, and salt and pepper. You can add more salt and pepper, if you like, to taste. Arrange the spears into a single layer on the baking sheet. Broil the asparagus, shaking the pan every few minutes, until they are tender and lightly browned, about 8 minutes. Sprinkle with lemon juice before serving. Try sprinkling sesame salt on it along with the lemon juice for an extra hit of nutty flavor. Sesame salt is perfect for any time when you want to add a bit of extra savoriness to a dish. It’s great over soups, salads, or whatever. Give it a try, and kick up your next dish, sesame style. Coarsely grind the sesame seeds in a spice grinder, food processor, or mortar. Cook in a small skillet over medium heat until lightly browned. Transfer to a bowl and mix in the salt. Let cool completely. Store in an airtight container in a dark cupboard. Use liberally. Corn chowder was one of the first Mexican soups I tried. I really liked it. They say you can tell the quality of a Mexican restaurant by it’s soup. So far, that rule of thumb has worked out for me. The best soups I’ve had seem to come from great Mexican restaurants. Eating out all the time to get corn chowder, or any other soup for that matter, is ridiculously expensive, though. I had to learn to make my own. I think this recipe stands up pretty well to it’s restaurant relatives. A hot corn chowder might be best suited for Autumn nights after harvest time, so freshly harvested corn can be used, but it works pretty well for cool spring evenings, too. This recipe specifies two pounds of frozen corn, but ten ears of fresh corn can be easily substituted. I don’t recommend using canned corn. Blech. Freezing the bacon for about 15 minutes will make it easier to cut, or you can cook it first and cut it later. Put half the corn and all the stock into a food processor or blender. Blend until smooth. Set aside. Cook the bacon in a large Dutch oven or kitchen pot over medium heat until crispy, about 8 minutes. Stir in the onion and cook until soft, about 5 minutes more. Stir in the garlic and cook until fragrant, about 30 seconds. Stir in the broth mixture and the milk, scraping up any of the browned bits (fond) off the bottom of the pot. Stir in the potatoes, bay leaves, thyme, and parsley. Bring to a simmer and cook until the potatoes and just starting to get tender, about 15 minutes. Add the remaining corn kernels and the cream. Keep simmering until the corn is tender, but still has a bit of resistance to it, and the potatoes are cooked through, about 5 minutes. Discard the bay leaves. Season with salt and pepper to taste and serve immediately. As a foodie I would never admit to ever making canned soup. That would be a blasphemous affair just short of the sort of things you have to confess to your Bishop to fully repent of. Fortunately, the Atonement makes any times I may have accidentally opened up a soup can and heated up the contents, with the intent to consume, something I don’t have to admit to. According to Doctrine and Covenants, Section 58:42, “Behold, he who has repented of his sins, the same is forgiven, and I, the Lord, remember them no more.” If the Lord isn’t going to remember them, I’m certainly not going to bring them up. 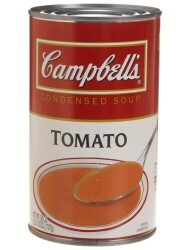 With that in mind, I want to reveal to you the real directions for making canned soup. These have been gleaned from countless experiences doing so. By other people. Don’t ask is they were my experiences. Then I’d have to repent for lying. Laugh at the directions on the can. Openly mock those involving a stove while merely ignoring those describing the microwave. Immediately slice open thumb on lid. Curse more while cleaning and bandaging the wound. Ignore the blood in the soup. Throw the lid forcibly into the garbage can to punish it for what it’s done. Dump the contents of the can into a microwave safe (meh) bowl. Loose appetite while looking at the congealed mess that bears little to no resemblance to soup. Add water, as desired, to thin the mess down. Never use more than half of the recommended amount. Microwave on high until it reaches the temperature of molten lava and burns to the sides of the bowl. Remove from the microwave and eat directly from the bowl, trying to avoid burning yourself until it cools, but failing. Ignore the mess left in the microwave from the exploding soup and let someone else clean it up.